Oprah says that the universe speaks to us in a whisper. If we don’t get the message, it uses a brick. If we still don’t get the message, the house falls down around our heads. It’s cheaper and easier to get it in the whisper. Animals first speak their hearts to you in a whisper. If you don’t hear them and respond appropriately, then they have to escalate their message to get your attention. If you still don’t get it, then they start eating your Manolos, peeing on your things, biting, running away, being aggressive or depressed, or getting sick, lame, or even dying. It’s cheaper and easier to get their messages in the whisper. And that’s what animal communication and my 5 Step System for solving problems is all about. How to get it in the whisper. Val, Damn – you’re good! I’ve heard a lot of your calls over the years and this one really was outstanding. I felt your passion for what you do, I learned a lot and am so inspired. The exercise you offered was wonderful! I know I’ll listen to that one again and again. Can’t wait for the Retreat! Thanks again! The first Step in the H.E.A.R.T. System for Solving Problems with Animals is to be able to Hear them so you can get it in the Whisper. In fact, the class was so popular, we ran out of phone lines! Some folks couldn’t get in and we’re truly sorry for that. If you missed out, you can still get the recording. And if you’re ready to take the next Step, then take action now. The Animal Communication Virtual Retreat starts NEXT SATURDAY, Feb 11th. Seats are going fast so be sure to sign up quickly. 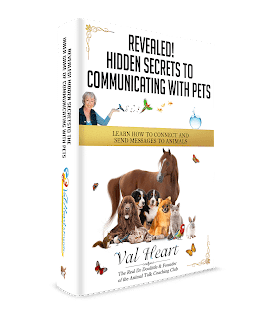 HINT: Don’t wait too long to listen because in addition to the incredibly good, powerful content (my BEST techniques, tips and secrets),you’ll also discover how you can save up to $700 on your investment in the Learn Animal Communication in 6 hours Virtual Retreat!